Vegetable-Tanned Leather is made with plant-based tanning solutions, not modern chemicals. It is pinkish or flesh-colored all the way through. It is readily available and may be referred to as tooling leather, and it is generally the only type that should be used. Chrome-Tanned Leather should NOT be used. It is made with chromium or other modern chemicals and can be most any color, but the cut edges are often a different color from the faces. Topgrain Leather has one smooth side, which was the animal's skin surface. This smooth side is called the grain side, while the rough inner side is the flesh side. 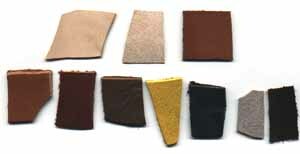 All surviving Roman leather is topgrain, as far as is known, and always seems to be used smooth or grain side outwards. Split or Suede Leather should NOT be used. It is rough on both sides, being the inner layer of a thicker hide which has been split into one topgrain layer and one or more "split" layers. Rawhide is animal hide which has been dried (by salting, etc.) but not tanned or processed into leather. It is generally white or translucent, and very stiff and hard. It is worked by soaking in water to make it pliable, and when it dries it can shrink with great strength (so be careful what you stretch it over!). Dog chew toys are a good source of rawhide if you don't need large pieces. It is quite possible that shields were faced with rawhide (likely fairly thin) rather than with tanned leather. See the Suppliers page for a list of leather dealers. Top row: Vegetable tanned leather showing grain side, flesh side, and grain side after oiling with neatsfoot oil. Bottom row: Various chrome-tanned leathers. Note pale colors of cut edges. Leather thickness is given in "ounces", e.g., 2 oz., 4-5 oz., 8 oz. The higher the number, the thicker the leather. Two-ounce leather such as calf or goat skin is about 1/32" thick, while 8 oz. leather is a full 1/8". Leather is priced by the square foot (s.f. ), but usually sold by large pieces such as sides (basically half the animal), double shoulders, etc. "Bellies" are long narrow pieces from the animal's belly area, and they are cheap because they are considered to be lower in quality. They are a good source for shoe soles, but they are too narrow to for caligae uppers. There is generally no need to use the highest-quality tooling leather, as the lower grades are still perfectly strong and functional (as long as you stick to vegetable tanned types). At bottom, Waxed linen thread, lump of bees wax, and needles. In addition, you may want a pair of pliers for pulling the needle through the leather, and scissors can be used for some cutting. Always make sure your knife blade is sharp! 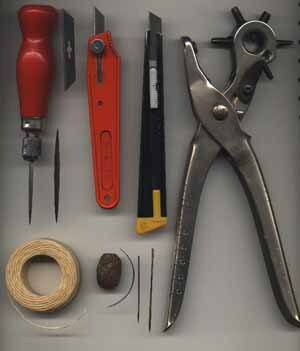 Other tools include edge slickers and bevelers for making niced finished edges on your work, thong cutters for making laces, drive punches for making larger holes than a rotary punch will do, etc. Always trace or draw the shapes to be cut on the BACK of the leather, not the front! Use a pencil or chalk rather than a pen or marker. A variety of dyes are available, either alcohol- or oil-based. Most leather items should also be oiled with neatsfoot oil, either natural or a modern "compound". This makes the leather supple and waterproof, though it will darken the leather as well. Never bother to dye leather brown--simply oil it until it reaches the shade you want. Oil can be applied with a brush or a rag; it may look very blotchy and uneven at first, but the color will become more even in a couple days. Mink oil, cod oil, and lanolin have also been used, and things like tallow were probably used, but do not use olive oil, linseed oil, etc. With very thin leather it may be possible simply to drive the needle through it, particularly if it is a leather-working needle with a triangular or diamond-shaped point. Otherwise, use an awl to make the holes first. Usually you can align the pieces being sewn and punch through both at once. Spring-type clothes pins may be helpful for holding the pieces in place while you work, or you may even be able to glue them together and then sew. For longer seams it's best to punch and stitch a half-dozen holes at a time. An old phone book makes a good surface to rest the leather on while you push the awl through it. Piercing holes in this way, with an awl, leaves the leather at full strength because the fibers are merely pushed aside; punching a row of holes with a rotary punch cuts the fibers and weakens the leather along that line. Use white or natural linen thread, not polyester, nylon, or artificial sinew. Wax the thread by drawing it across a lump of bees wax, and repeat this occasionally as you sew to keep the thread from fraying. Running Stitch--The simplest in-and-out stitch, giving the appearance of a dashed line (- - - -). Start by making a knot at the free end of the thread, and when you reach the end of the seam or the end of the thread, knot or tie it off. Two-needle Stitch--Use a length of thread with a needle at each end. Put one needle through the first hole and center the thread, then pass both needles through each hole from opposite sides. This makes sort of a double running stitch (------). At the end of the thread or the end of the seam, simply backstitch about 3 stitches to secure it. The same sort of effect can be achieved by doing a regular one-needle running stitch, but reverse course at the end of the seam and continue back to the beginning. Tent Seams (right)--Roman tents were sewn with several distinctive seams which are designed to be waterproof, and which may be useful on other items as well. 1. and 2. show the two steps in sewing the reinforced or welt seam. First the two pieces are laid grain sides together and a narrow strip called a welt is laid along the edge, projecting beyond it. All three layers are sewn together with a 2-needle stitch. Then the outer layer is turned up and the free edge of the welt is sewn to its flesh side with tunnel stitches, meaning that the needle goes into the flesh side and back out again without ever coming through the outer grain side. Either a whip stitch or a running stitch may be used to secure the welt. When properly done there are no holes through the leather, and water runs off without getting into the seam. Shown below is a photo of the inside of a welt seam, with a whip stitch at the edge of the welt. 3. A wide reinforced seam, similar to the welt seam but the welt is wider and tunnel-stitched down along both edges. 4. A bound seam, used at the corners of tents.